Alongside Detroit's East Davison Freeway, new development has been at a standstill for what seems like forever. But a new plot will recruit dollars from the community, expertise from professional skateboarders, and the work of kids in the neighborhood to build a skate park. This skateboarding space is designed by Mitch Cope and Gina Reichert (the couple who helped spur on the Juxtapoz Magazine/Power House Productions design installation). Pro skateboarder Tony Moriana and Thrasher Magazine photographer Joe Brook are two of the guys behind Ride It Sculpture Park. 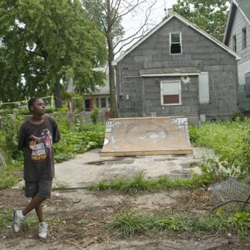 The plans call for transforming a vacant house and four empty lots into a skate park; with some cash from Crowdrise and the help of skateboard professionals and neighborhood teenagers.